AN UP-and-coming sport is flying its way onto school pupils' schedules in Dunbar thanks to the man behind the county's first disc golf course. Seamus Scanlon, originally from the United States, opened ReBoot Disc Golf course at Dunbar's Foxlake Adventures facility earlier this year. The sport is popular across the Atlantic but is still on the rise in the UK. However, he hopes to inspire a generation of youngsters to take up the game after gaining funding to donate portable steel disc catchers and 40-plus discs to the Dunbar schools cluster. The equipment will be shared among schools in the Dunbar area and plans are already in place to start a yearly championship among those who take the sport up. Seamus, who grew up in Worcester, Massachusetts, told the Courier: "We did some demonstrations through the Active Schools programme in the spring at Dunbar Primary School, and we did West Barns, Innerwick, East Linton - and it was well received. "We put together a grant through five different companies, which funded two steel baskets and enough discs for the physical education departments to use in the school system. "I'd like to think we can put together some clubs at each school and culminate with a once-a-year competition at each school and maybe a district championship. "It's just to increase awareness of disc golf as a sport and generate awareness of the sport." Disc golf works like ordinary golf - except the tools used to play are different. 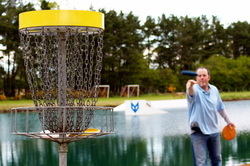 Instead of a ball, a frisbee is used, and instead of a hole, the game has a basket with chains to catch the frisbee. The player's body acts as the club, throwing the disc towards the basket - the best players able to throw well over 100 metres. "It's a lifelong sport, it's a passive form of recreation," Seamus added. "Personally, I've been playing for about 20 years. "My wife is originally from Aberlady but I've been here less than a year. "It's very high profile in the United States. In my home city in America there are 15 disc golf courses. "It was an opportunity to start a business. It's open to the general public. Disc golf is a very inclusive sport and anybody can play. You don't need a tee time." ReBoot Disc Golf has already landed itself a prestigious competition as it hosts the British Nationals in October. Funding for the schools' equipment came from the Professional Disc Golf Association Marco Polo Grant, ReBoot Disc Golf, Vibram Disc Golf, Latitude 64 Disc Golf and British Disc Golf Association.